Well, the story goes that in 1895 in the Cafe de Paris in Monte Carlo a classic was born.. by mistake, or so the legend has it. According to Henri Charpentier, he was serving nobility at the restaurant table side with crepes which were pre-prepared in the back. While preparing an orange sauce, he added the liquor over the open flame and voila! We had orange crepe flambe and everyone raved. The dish was appropriately named after one of the dining guests “Suzette”. I made a quick and easy version here at the beach house at The Sea Ranch which came out quite nice. In a small sauce pot combine 1 tbsp zest from the orange, all of the juice from the orange, 1 stick of butter, and the sugar. Set burner on low. Keep an eye on this pot, we want it to boil, but it will quickly boil over if ignored. In a separate bowl, add eggs and whisk, then add baking powder, flour, salt, 3 tbsp melted butter, and milk. Whisk all ingredients thoroughly. Try not to have any lumps. The consistency should be similar to heavy cream. If necessary, add a little milk or flour to obtain this consistency. Place a small non stick skillet on low heat (depending upon your range, you may find that you need to adjust it up accordingly). Add 1/4 C. of your batter to the hot skillet and roll it around so that it becomes thin and reaches the edges. After about 30 seconds, using a high heat rubber spatula, carefully lift up the edges and flip it over. You want to have small brown spots (not black) here and there on the crepe (It shouldn’t be doughy or pancake-ey either). If your fast, you can just start piling them up on a plate. Otherwise you should keep them in a low oven until you are done with all of your batter. If your sauce has not boiled yet, crank up the heat and stand over it until it does. When it boils pour in your Grand Marnier. If you’re comfortable, you can flambe at this point, otherwise don’t. 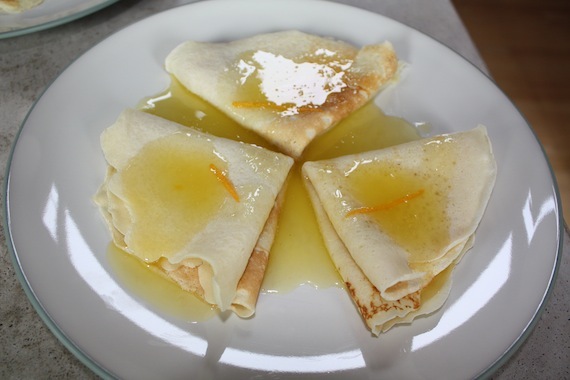 Fold crepes in half and then in half again to form quarter circles. Place two or three crepes on a dish and pour on some of the sauce. Alternatively, dredge the crepes through the sauce before plating. Serve immediately!